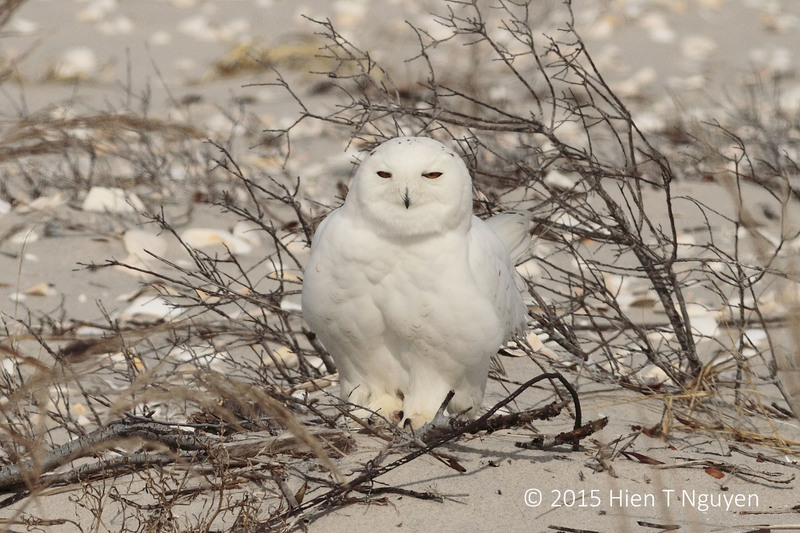 Last week, there were two sightings of the Snowy Owl on the Jersey Shore, so yesterday I went to the southern tip of Long Beach Island to find and photograph it. After walking for almost four hours, I failed to find the visitor from the Artic. 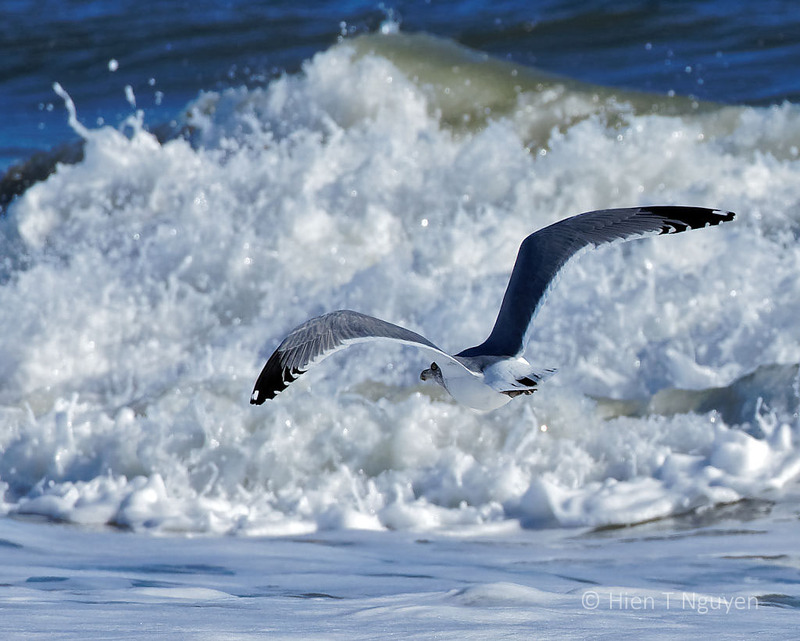 There were only Seagulls and some birds which flew by too fast for identification. 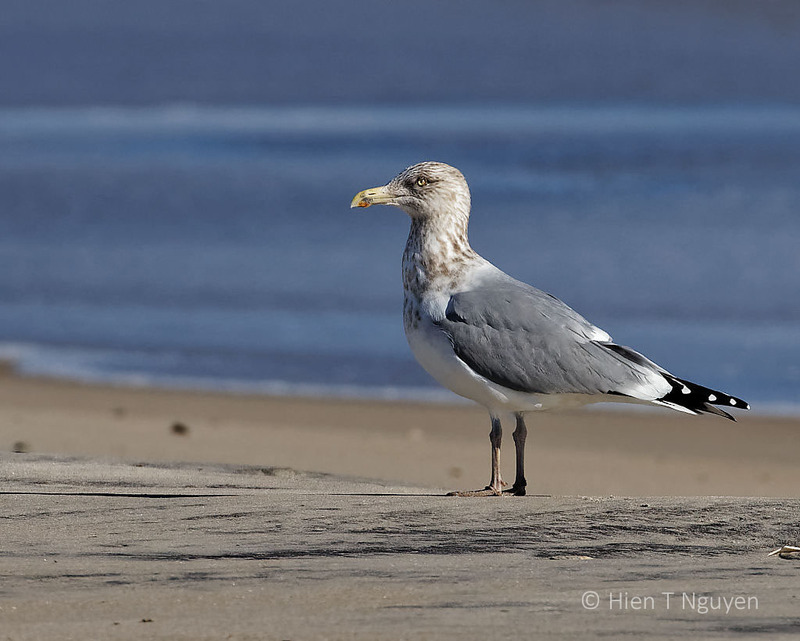 The above Ring-billed Gull had just walked out of a fairly large sea water pond on the beach. The pond banks, shaped by wind,looked intriguing. 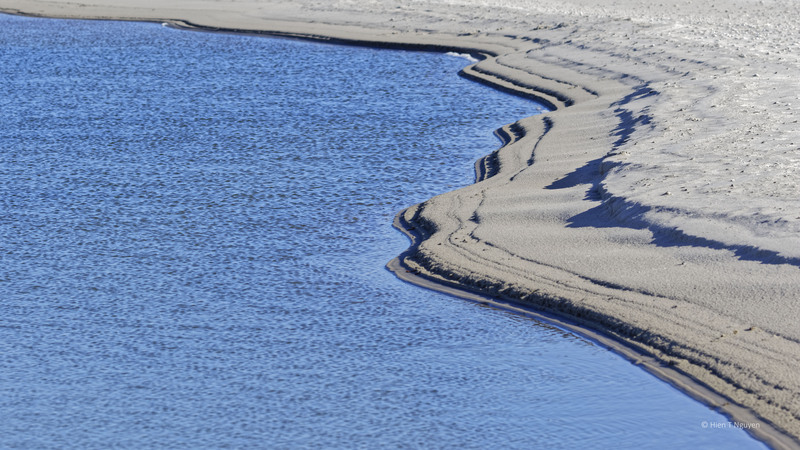 Sea water pond on beach at southern end (Holgate section) of Long Beach Island. Back home, it was cloudy today as the sun obstinately refused to come out. Our bird feeder, however, attracted the usual crowd of small birds, even after one of them was attacked and carried away by a hawk. 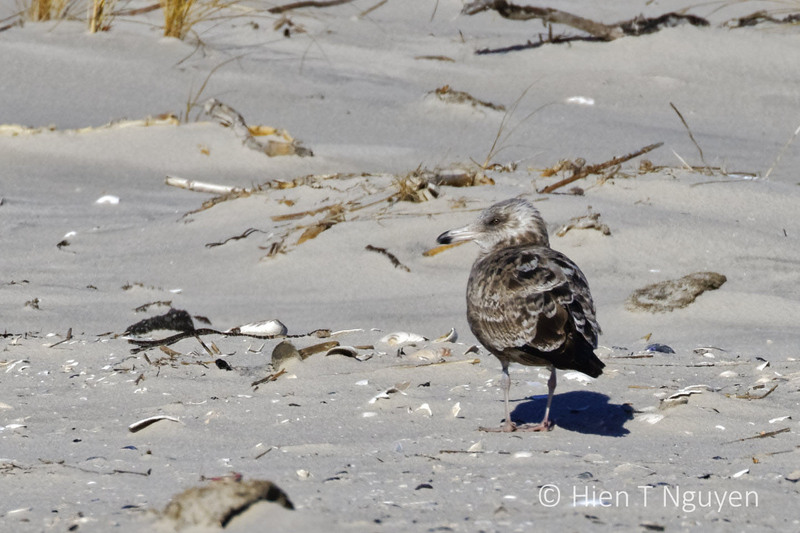 I didn’t have a chance to capture the hawk, but here are some photos of the small birds. 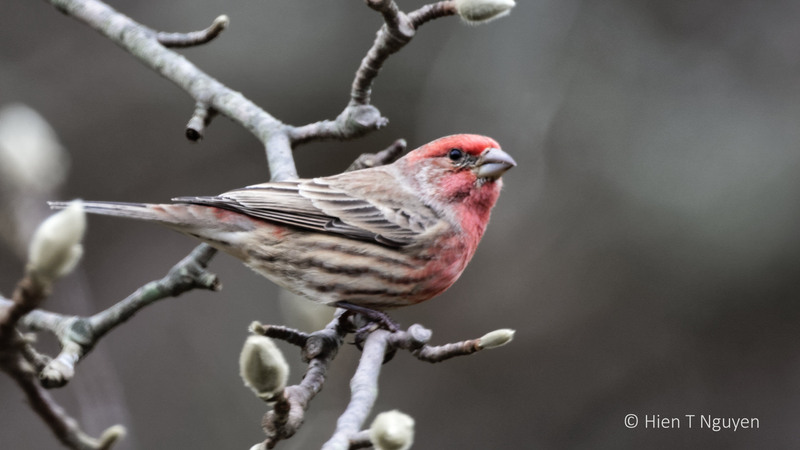 House Finch on magnolia branch. 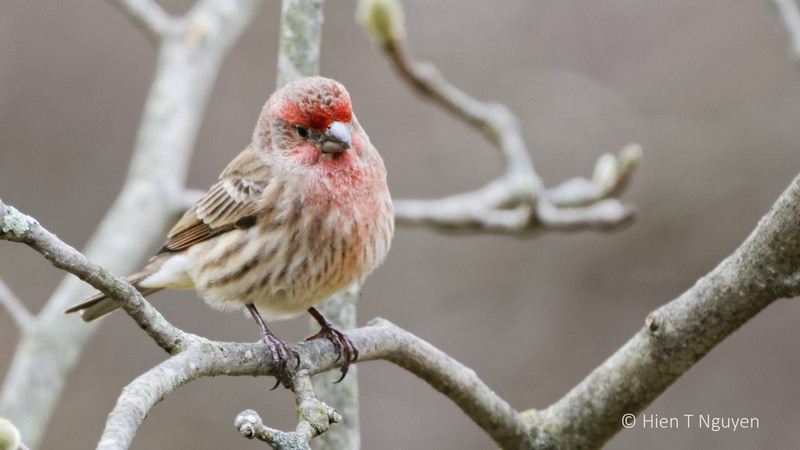 House Finch looking at bird feeder. 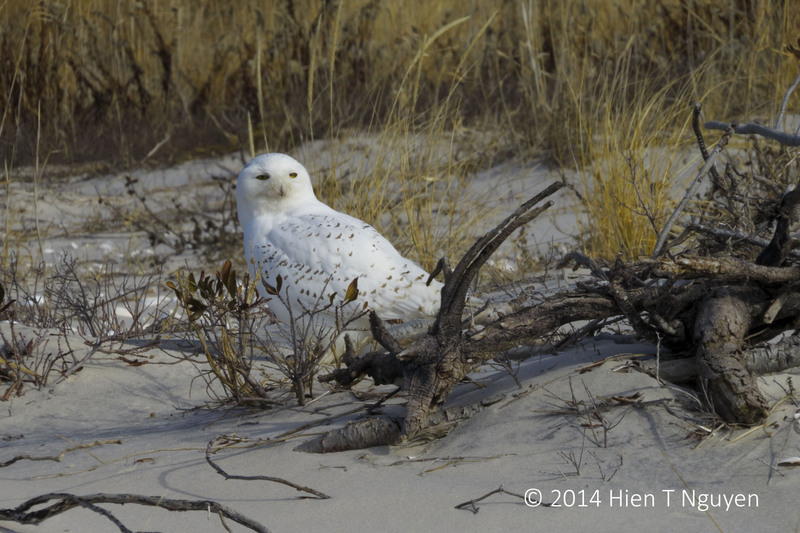 Last week, I used a Canon 400 mm lens with a 2X extender to shoot photos of a snowy owl displayed here. Using the extender gave me an effective 800 mm lens at a much cheaper cost than that of a large zoom lens, but it has serious drawbacks. Aperture was decreased by two stops and I could not go any wider than f/11. Autofocus was lost, forcing me to manually focus every single shot. Worst of all, image quality decreased significantly and visibly, even with the Canon 6D I was using. 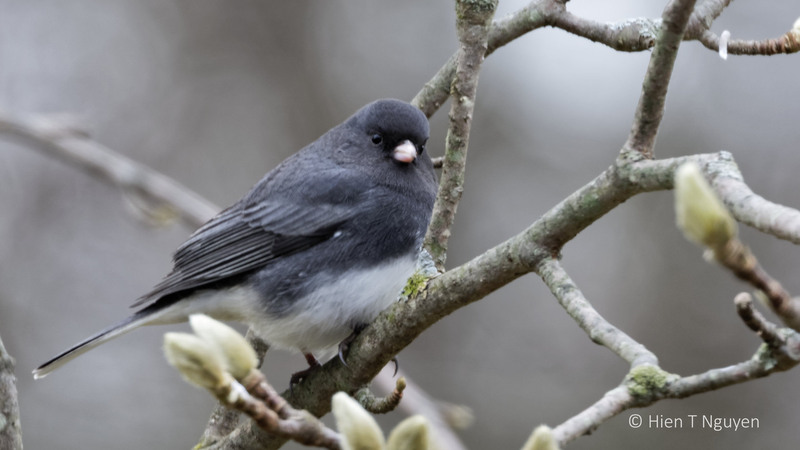 Yesterday, I left the extender at home and went with my first camera, the Canon 7D, which has a 1.6 cropped sensor, meaning that the 400 mm lens has effectively a 640 mm reach. On the other hand, the 7D has lower image quality than the 6D with a larger full-frame sensor. 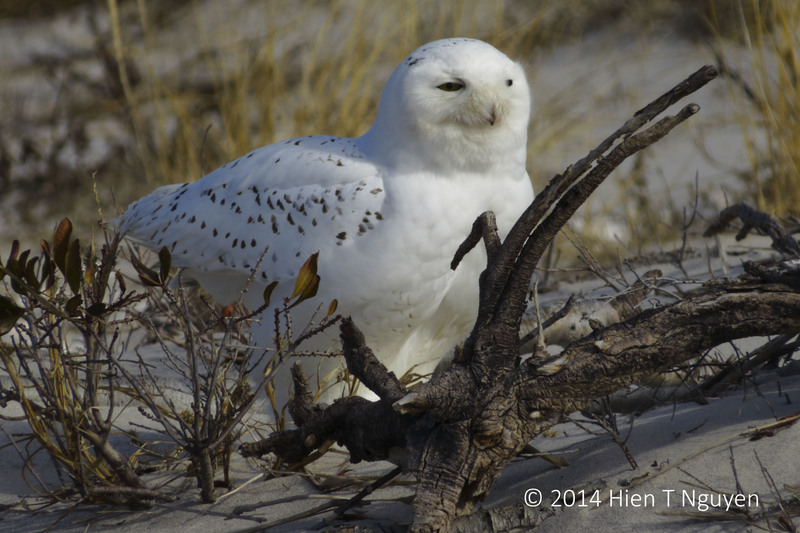 The snowy owl was there at Holgate, at almost the same location at the end of the island. There was only one other photographer around, and he left soon after I arrived. Thus I had the owl to myself and for almost two hours I took many shots of it. The sun was high, so lighting was not at its best, and the owl kept his eyes semi closed most of the time. The following photos show him with eyes open. Please comment and let me know if they are any better than those taken last week. Snowy Owl: There he is again with his camera. 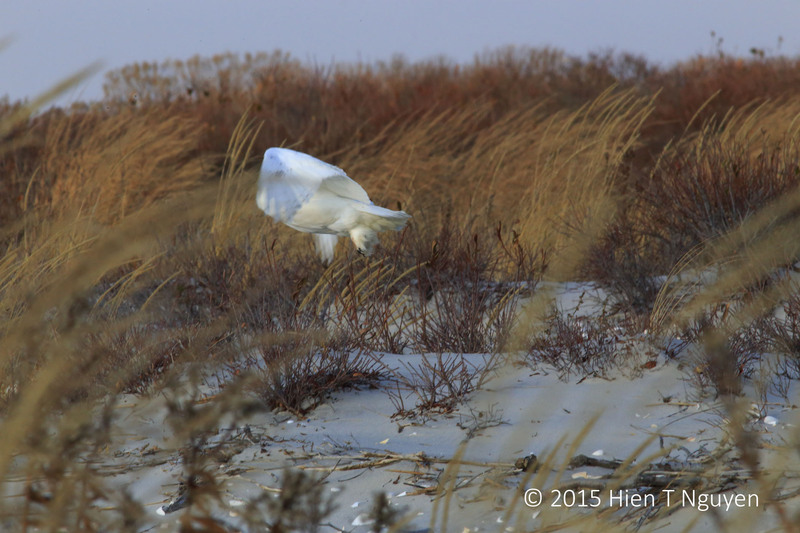 Snowy Owl: Why are you following me? Enough already! Another problem: after a few shots, the camera indicated that its memory card was full and would not allow any more shot. Without a spare, I had to spend precious minutes deleting a couple of hundred older images, one by one… Fortunately, the owl did not mind and remained at his station, patiently waiting. Don’t leave home without a spare memory card! 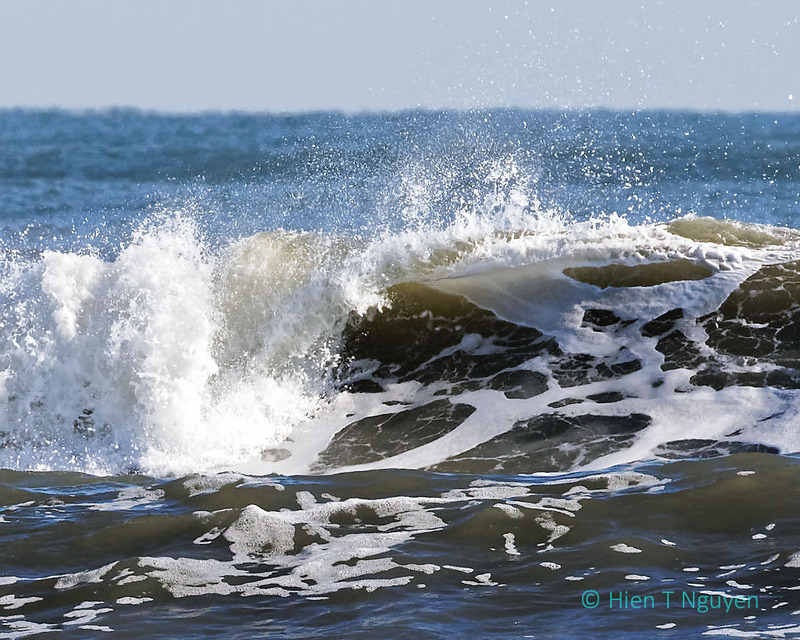 Yesterday I again went to the Holgate section of the Edwin B Forsythe National Wildlife Refuge. Temperatures started below freezing but by noon they had reached 38 F (3 C), there was no wind, so it was a relatively pleasant stroll for me. 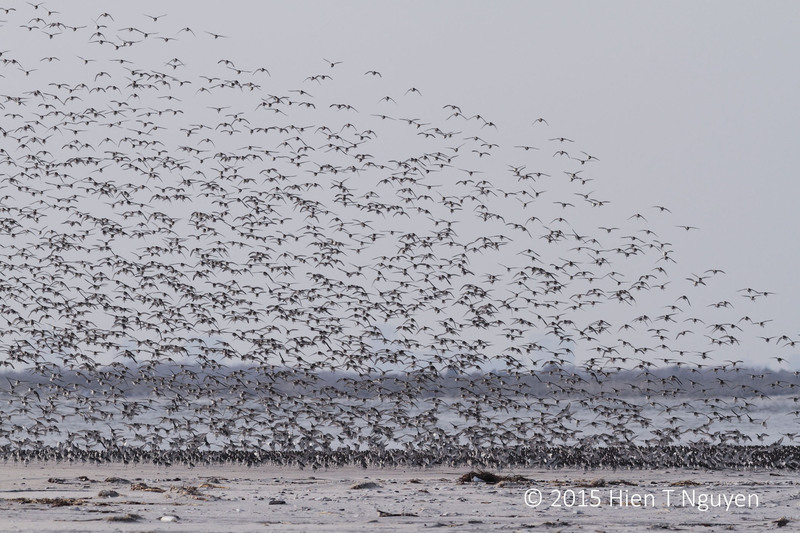 Along the beach there were literally tens of thousands of dunlins, many asleep. 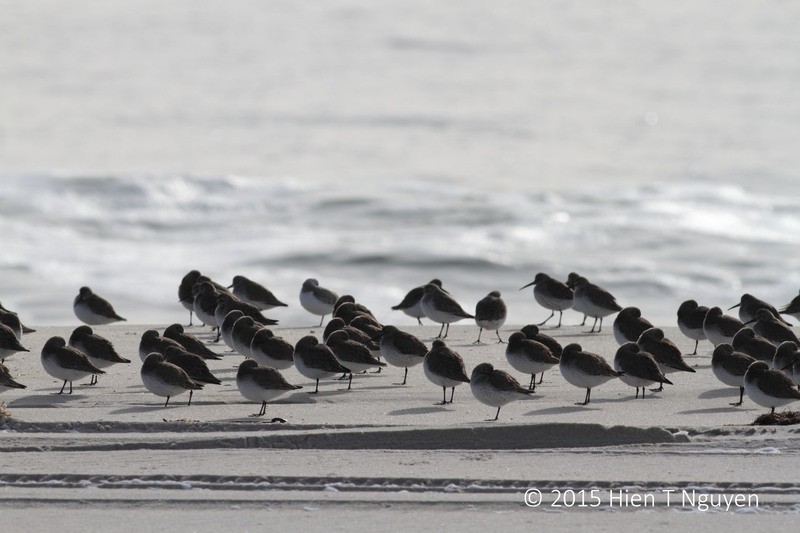 Dunlins, a kind of sandpiper, breed in the tundra near the Artic, and in the winter migrate to the East Coast as far down as Florida. 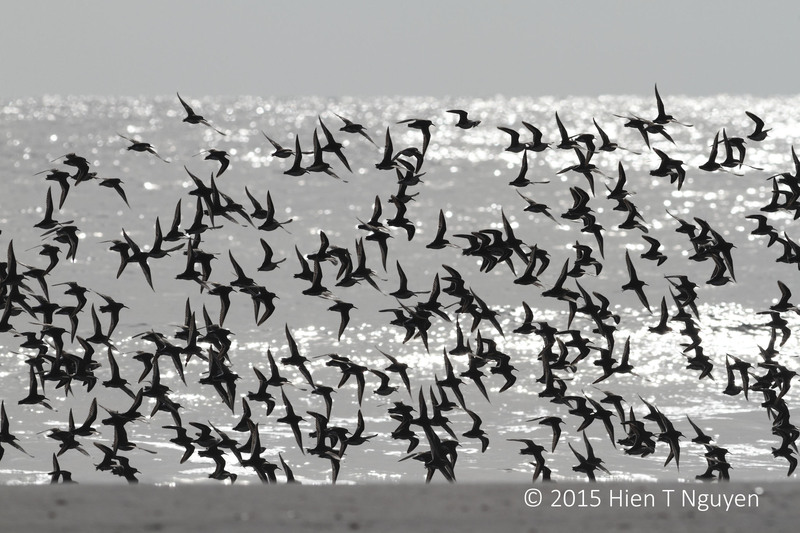 Once in a while, they would all fly up in unison. Then they would land ahead of me. This is how they looked after landing. 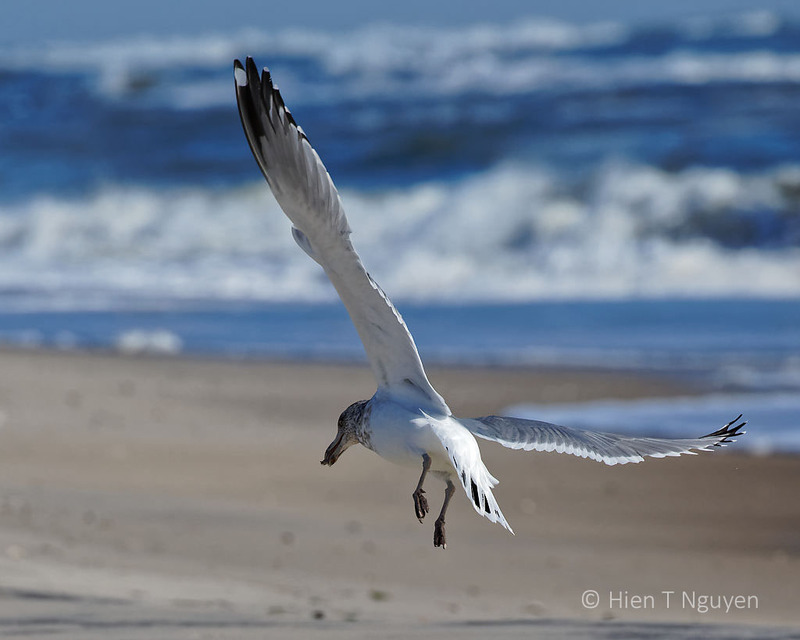 This taking off and landing took place several times, matching my progress as I neared the southern tip of Long Beach Island. 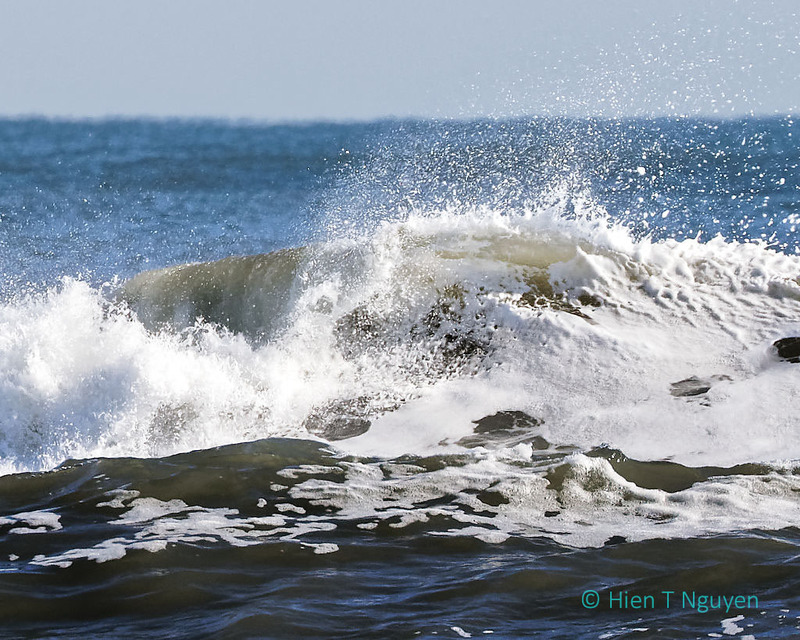 After a while I realized that there were no ducks of any kind in the surf. 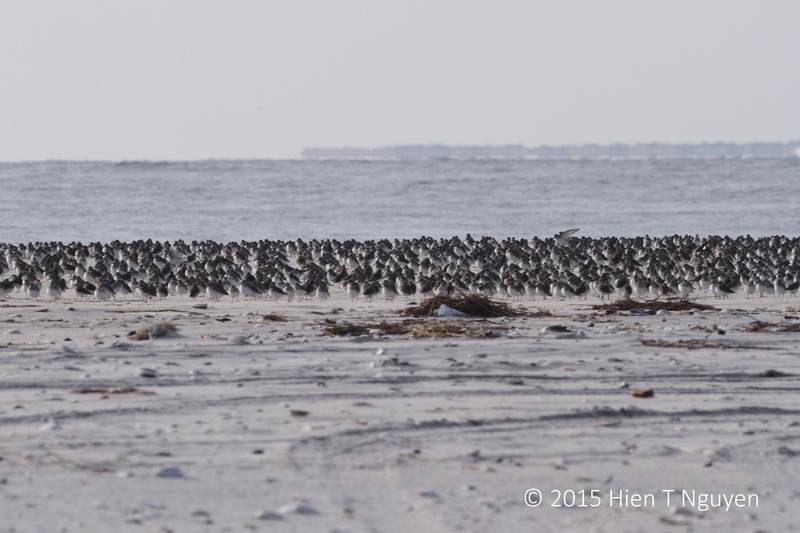 Last week there were Northern Pintails, Long-Tailed Ducks, Hooded Mergansers, and possibly other kinds as well. The explanation came by the time I reached the end of the island. 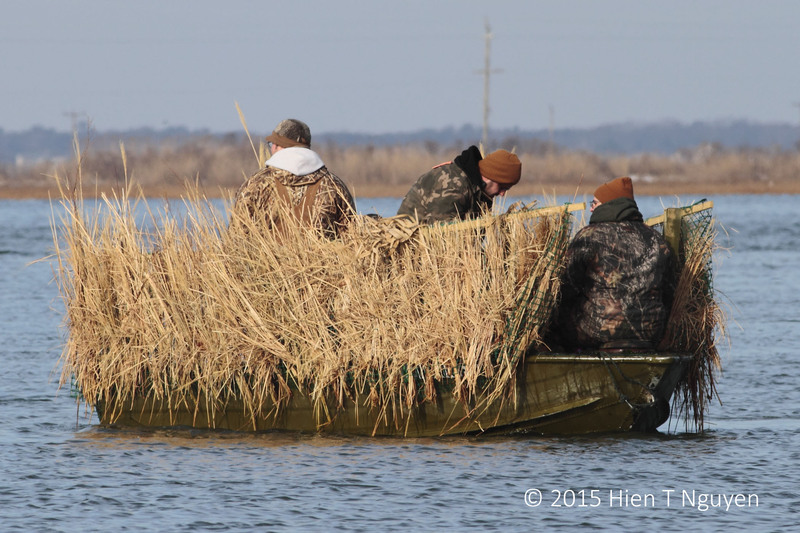 There was a camouflaged duck-hunting boat bobbing on the water, with several duck decoys floating around it. By the time I took the following picture, the hunters had gathered their fake ducks and were getting ready to move to another spot. 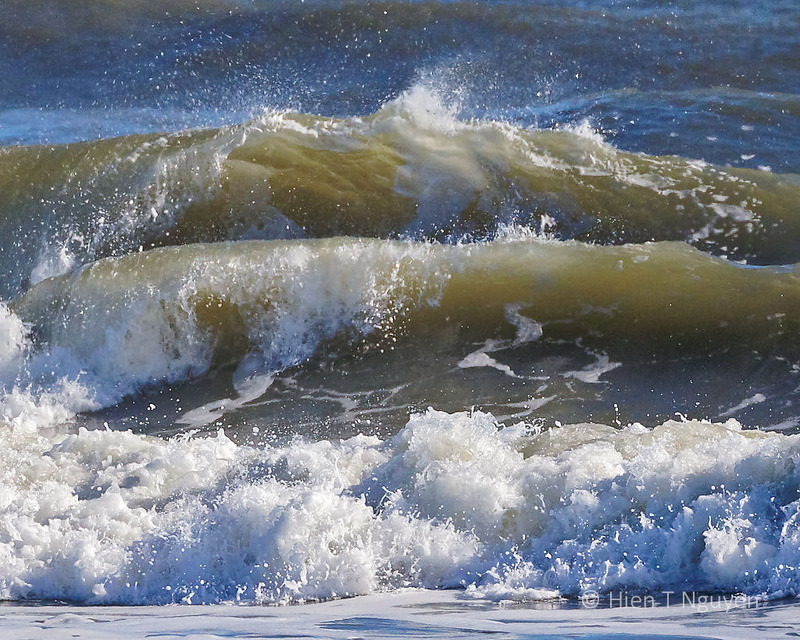 Last Friday, while walking back from the tip of the island at Holgate, I saw that the ocean waves were fairly high, and once in a while I heard the sound of clapping thunder as they crashed violently against the shore. 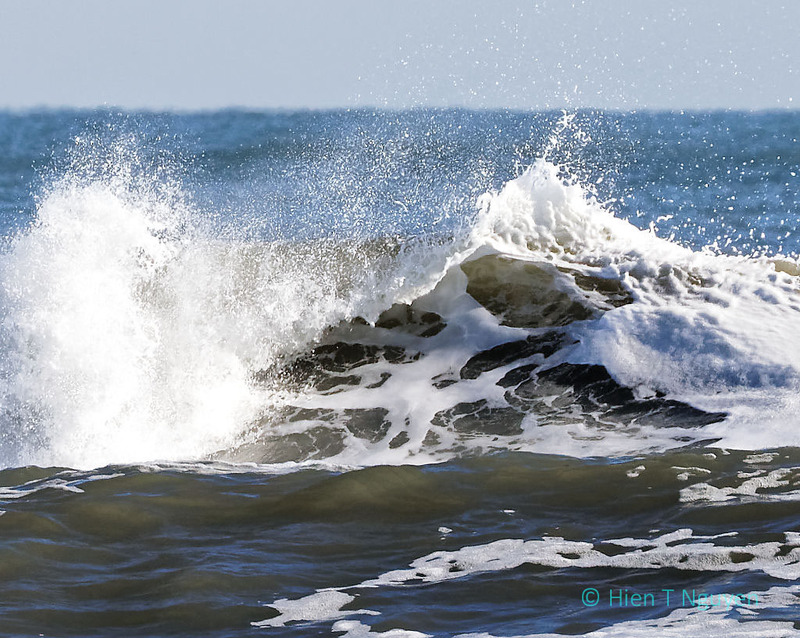 However, one surfer braved it all and seemed to enjoy herself. 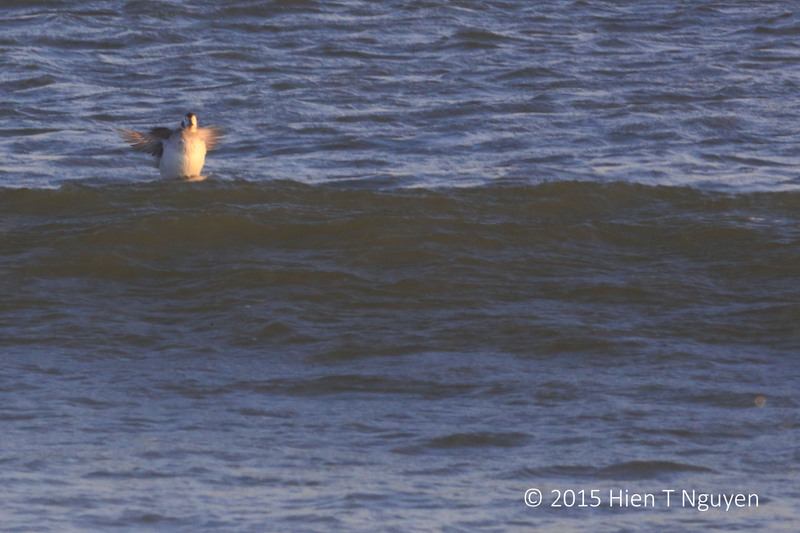 Long-tailed Duck surfing at Holgate. 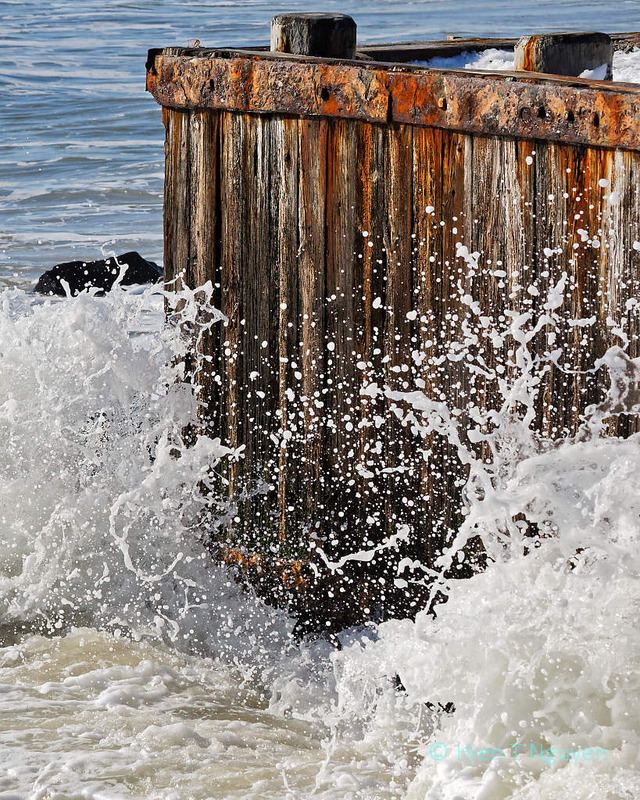 She was engulfed by the waves several times, but persisted and rode the waves fearlessly. 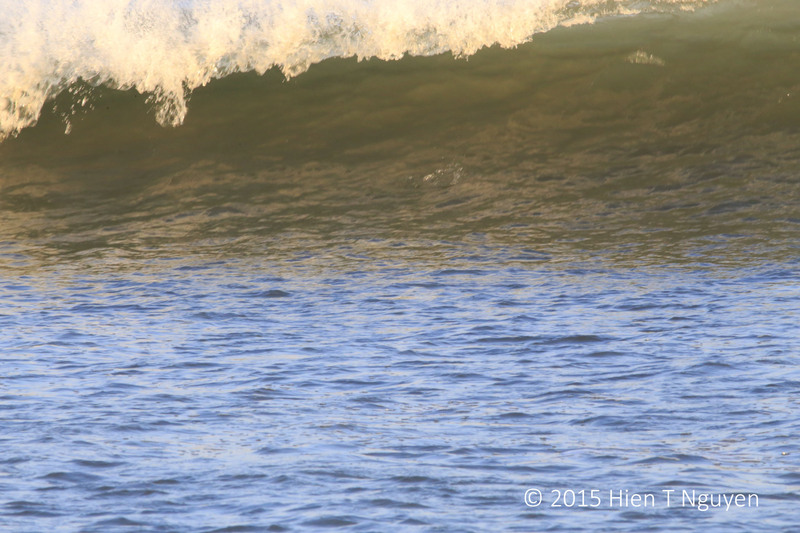 She was definitely the bravest among other surfing ducks that day. 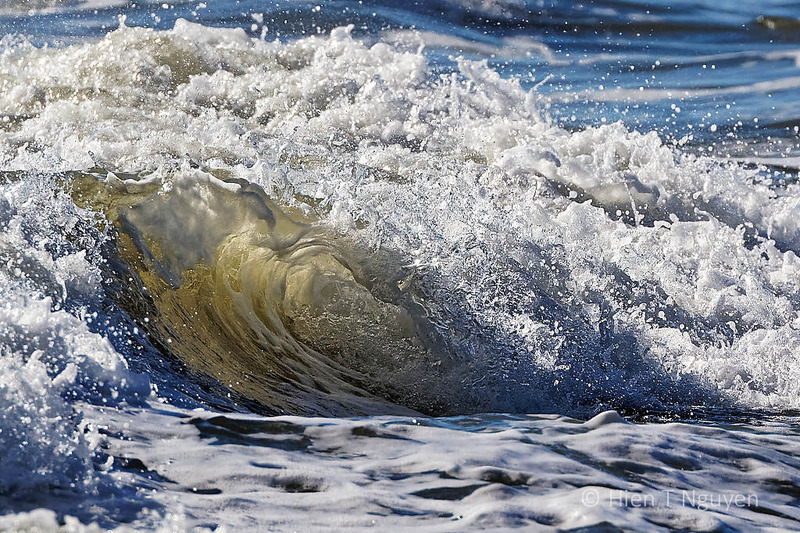 In the following photo, a wave was about to crash and I clicked the shutter just after several ducks dove in. 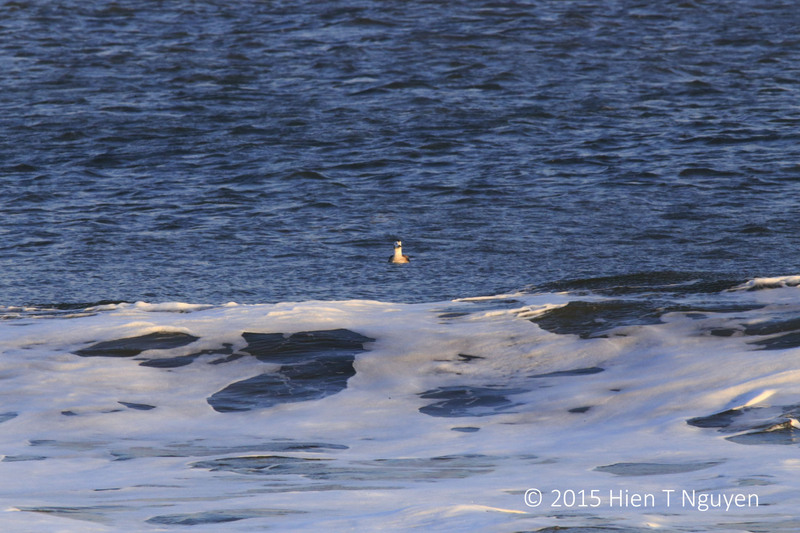 Long-tailed ducks are known for their diving prowess, able to go as deep as 200 ft (60 m) to look for food. 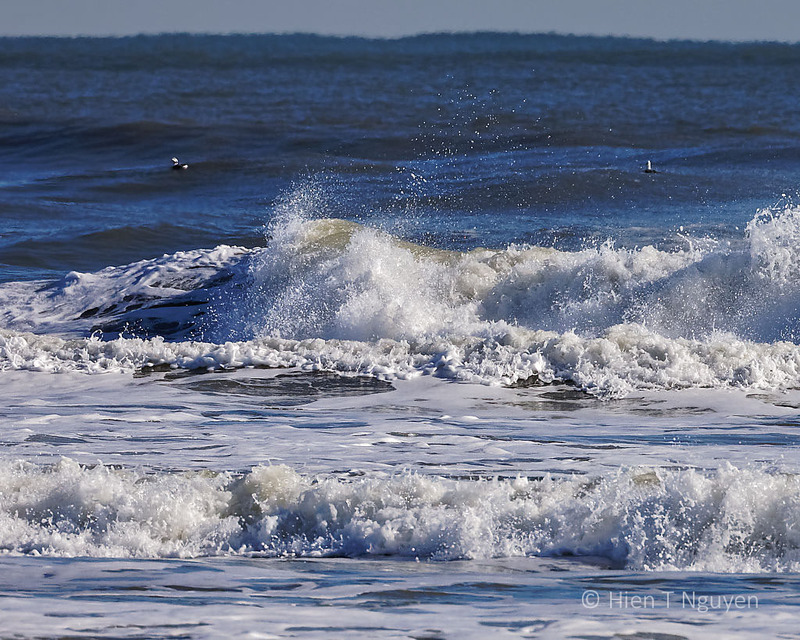 Crashing surf: there are some ducks in there. 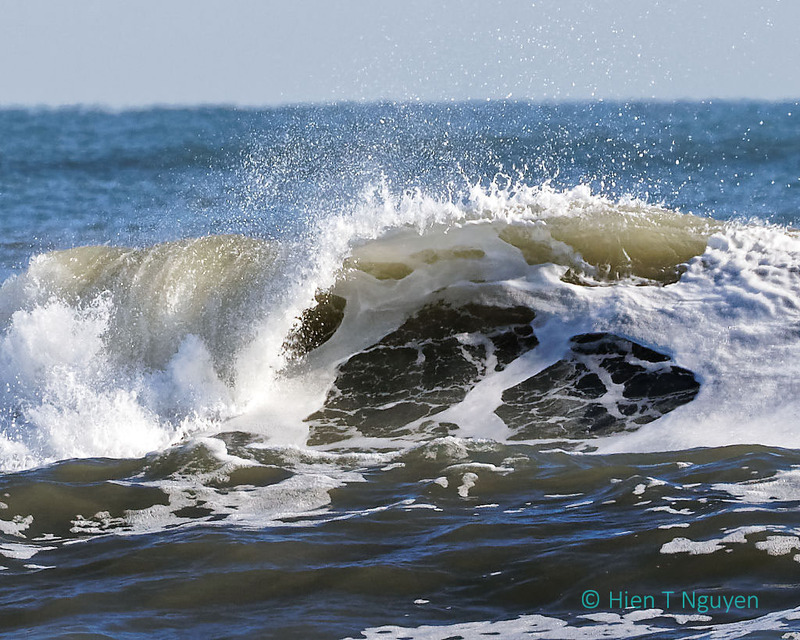 This is what our female surfer looked like after a wave had gone past her. 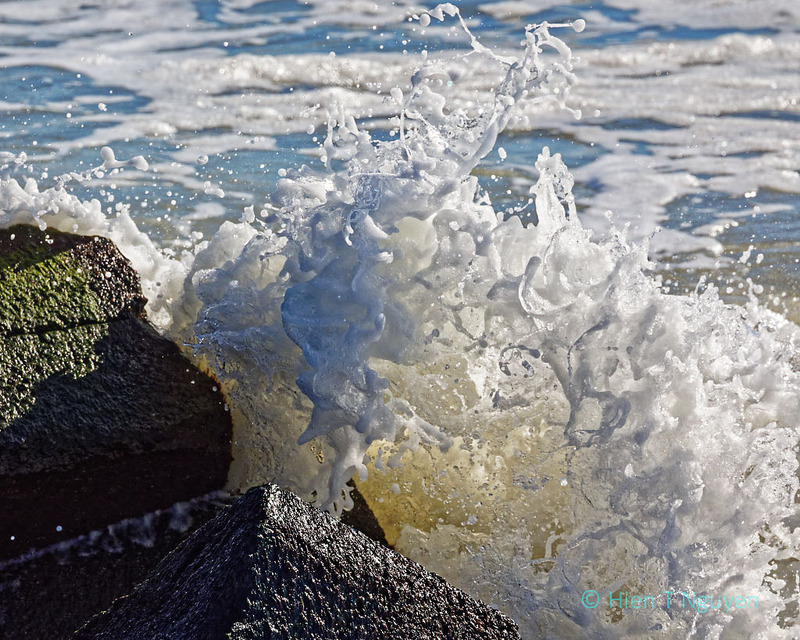 Finally, here’s a shot of the wave crashing against the beach. 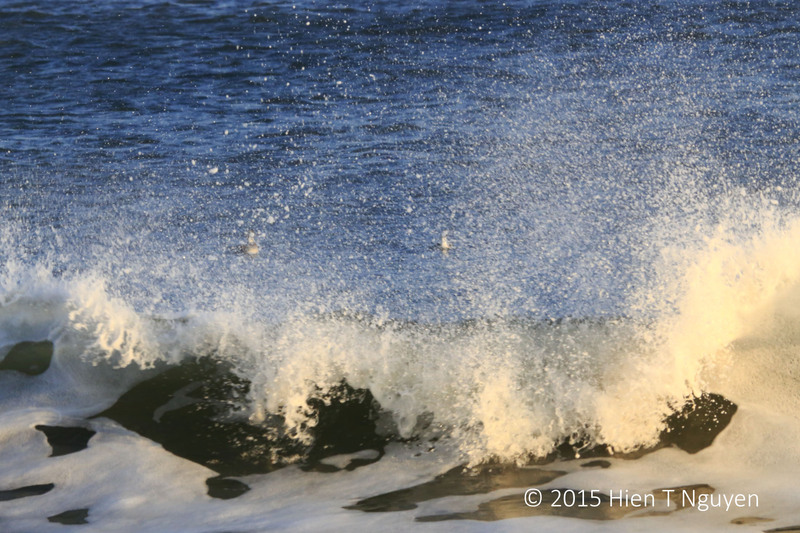 Long-tailed Ducks beyond crashing wave. 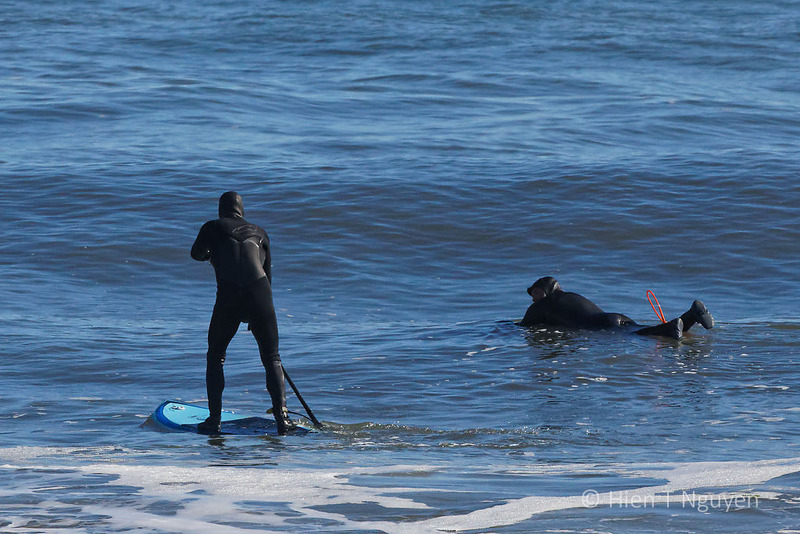 By the way, before starting my hike, I saw some human surfers at the parking lot, clad in their wetsuits. 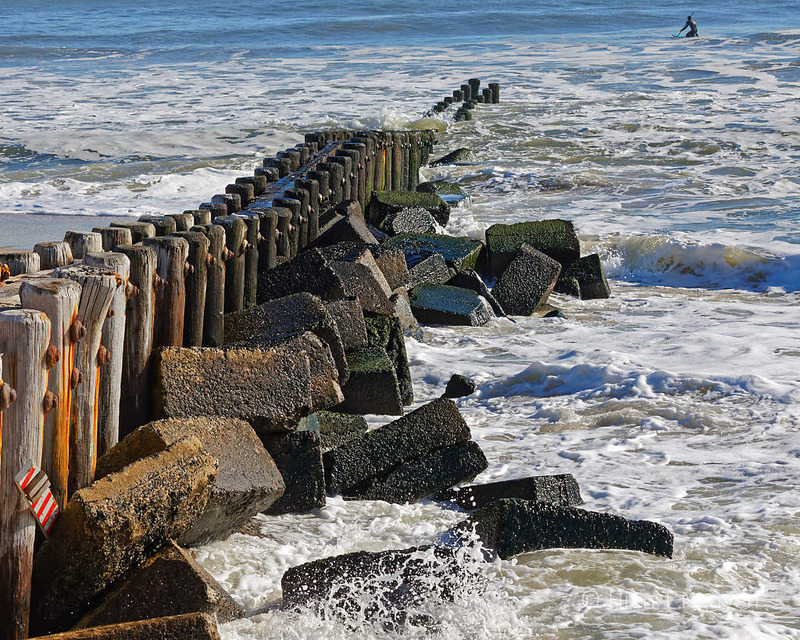 They had decided not to attempt surfing that day and were getting into their cars to drive out of the area. 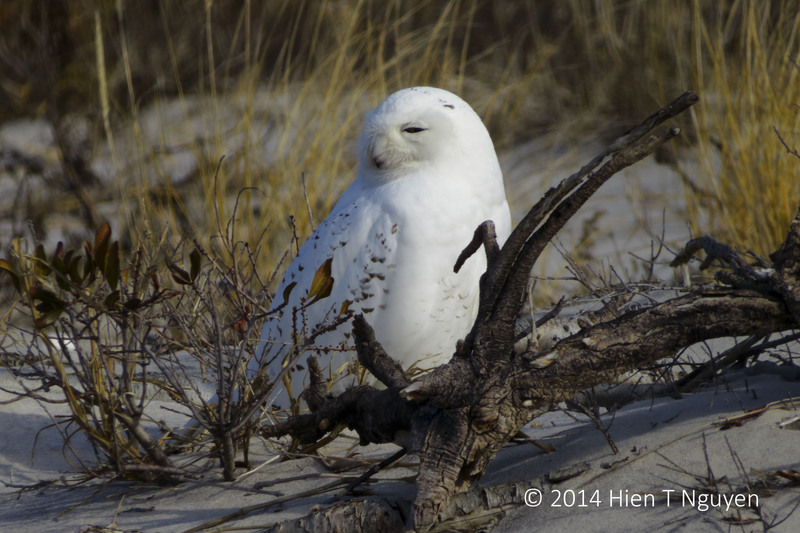 Yesterday I went to the Holgate section of the Edwin B Forsythe National Wildlife Refuge to try and capture images of the snowy owls that are known to stay there this winter. Temperatures hovered around a “balmy” 38 F (3 C), but wind gusts were up to 35 MPH (56 KMH) and at times I had to hold on to my camera even though it was attached firmly to a sturdy tripod. With hand warmers inserted into my gloves, my hands were kept warm, but my face was cold almost all the time. The 5-mile round trip hike took 3.5 hours as it was not easy to walk very fast in the sand, especially with a backpack and a tripod. But the weather kept people home and there was no one around during the whole time I was there! I went to the very tip of the island without seeing any owl. Finally, I stopped and was almost ready to go back when I heard a screech. 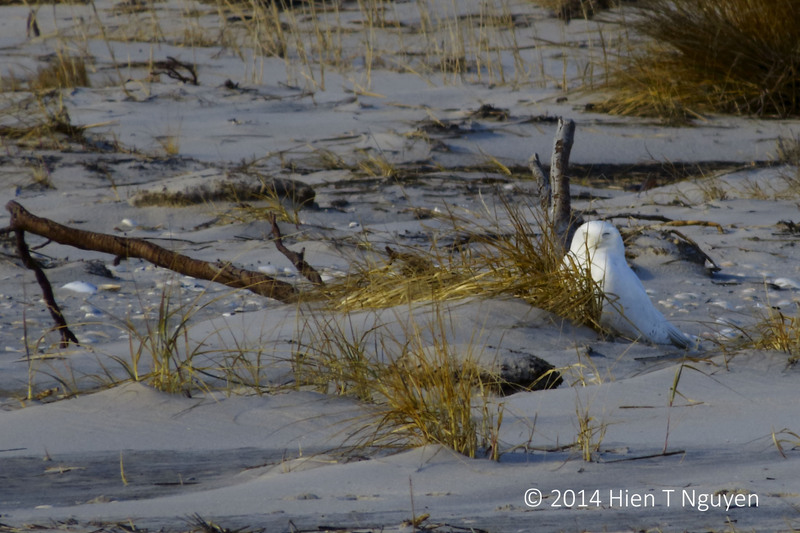 I turned and a male snowy owl was sitting in the sand among the grasses. 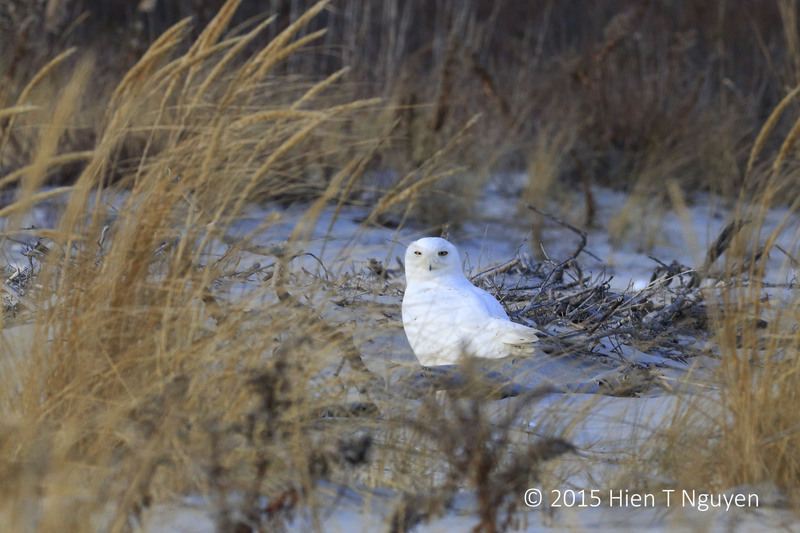 Snowy Owl: Hey, I am here! After the above shot, he preened himself for a while. This indicated that he was not disturbed by my presence or picture taking. The sun went behind some clouds making the scene slightly darker, which had the effect of making him open his eyes fully. 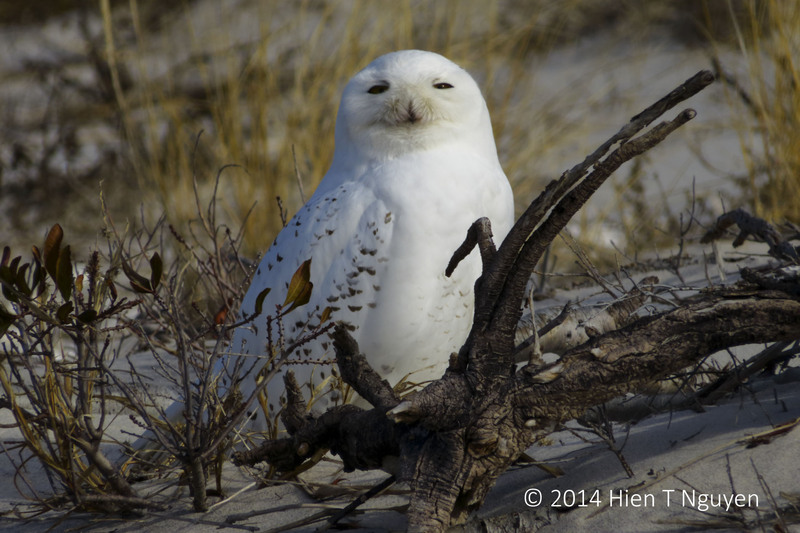 Snowy Owl with eyes fully open. 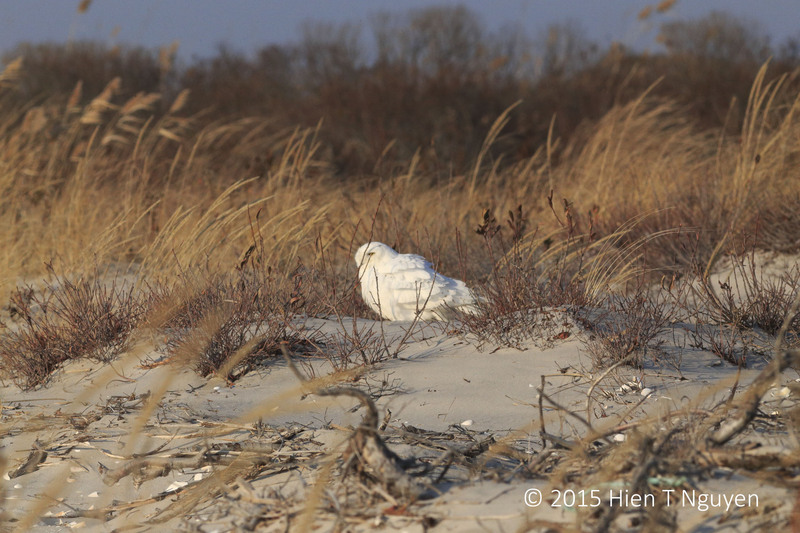 The owl seemed to be hearing something, perhaps a potential prey somewhere in the dunes, and prepared to fly away. Snowy Owl preparing to fly. He flew, but landed only a short distance away. 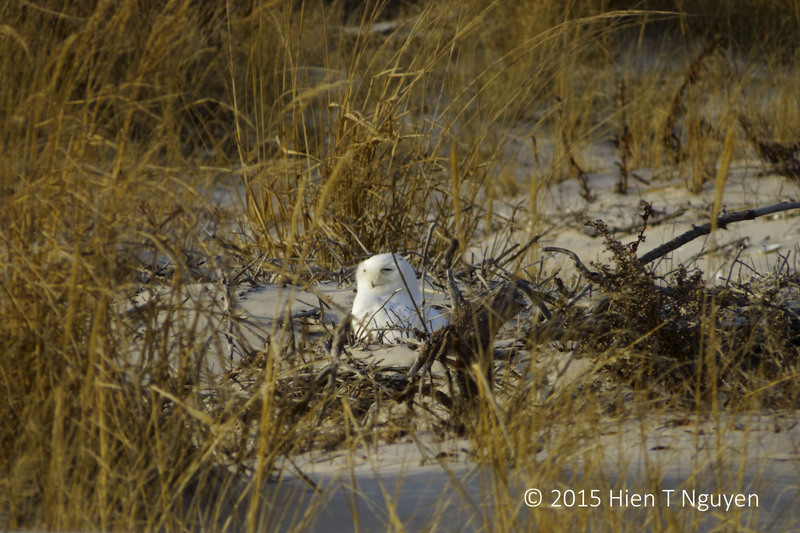 Snowy Owl after he had flown a short distance. Then he shook himself and fluffed his feathers. 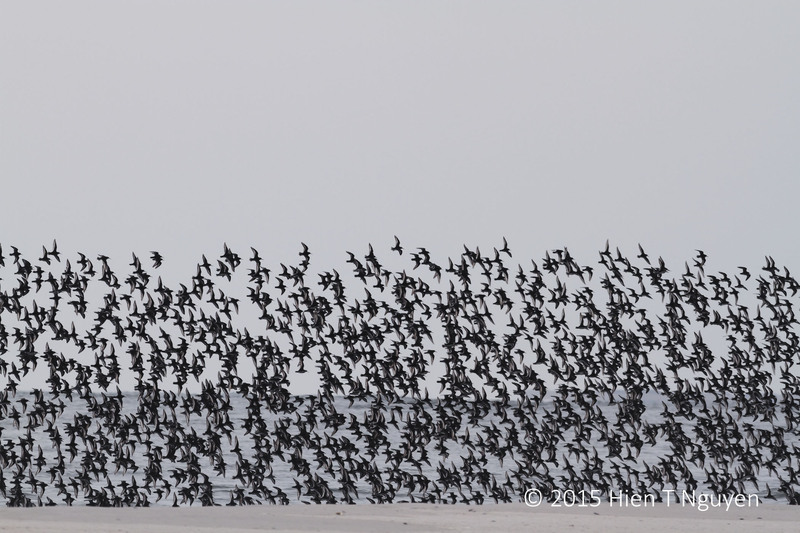 Birds do that to trap warm air between their feathers and their bodies. So he too was cold! Snowy Owl with feathers fluffed up. 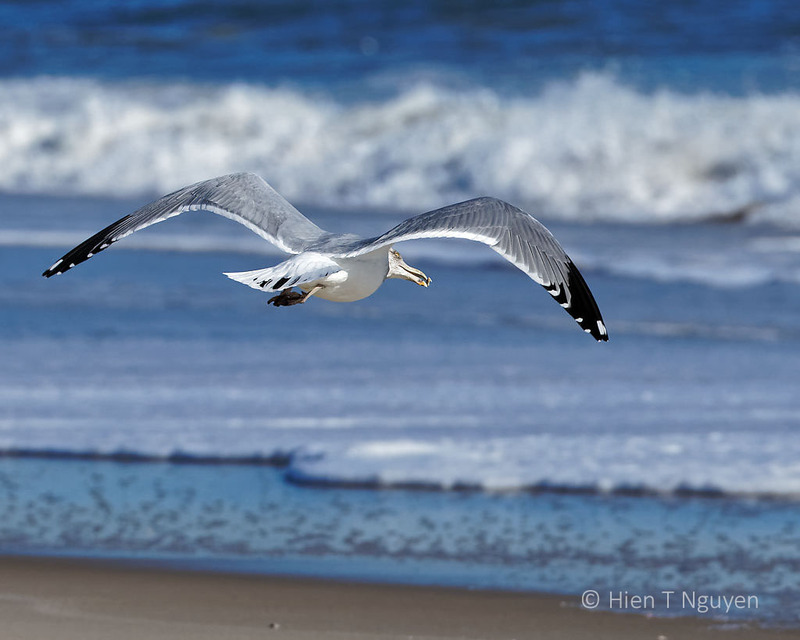 Then he flew up and soon was lost in the dunes. 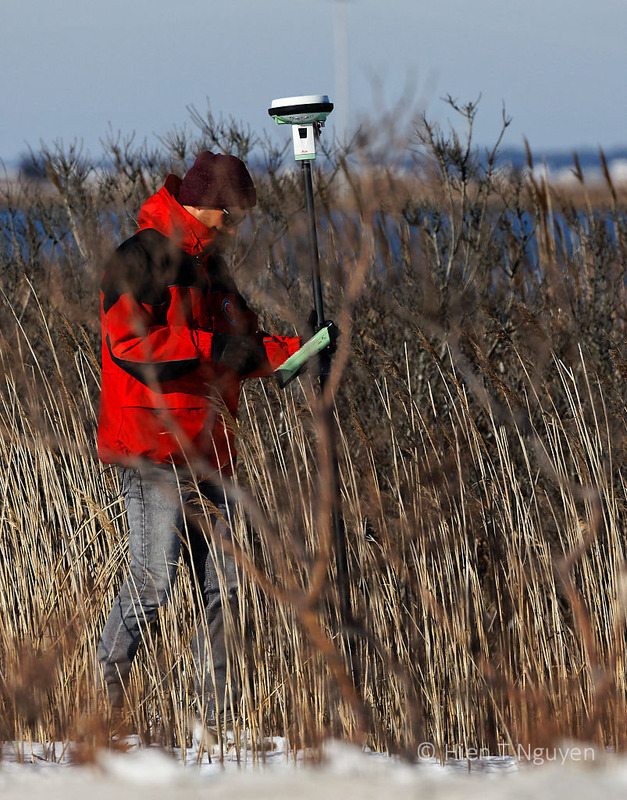 The Holgate section of the Edwin B Forsythe National Wildlife Refuge is on an island separate from its Brigantine section, the one I regularly frequent. For the first time today, I went to Holgate and walked along the beach, for a total of 4 miles round trip. 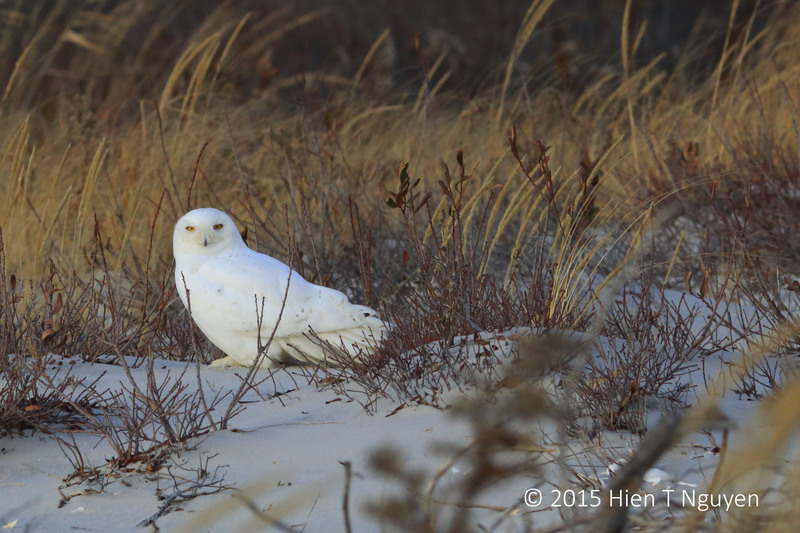 It was worth it, as I saw not one but two snowy owls. 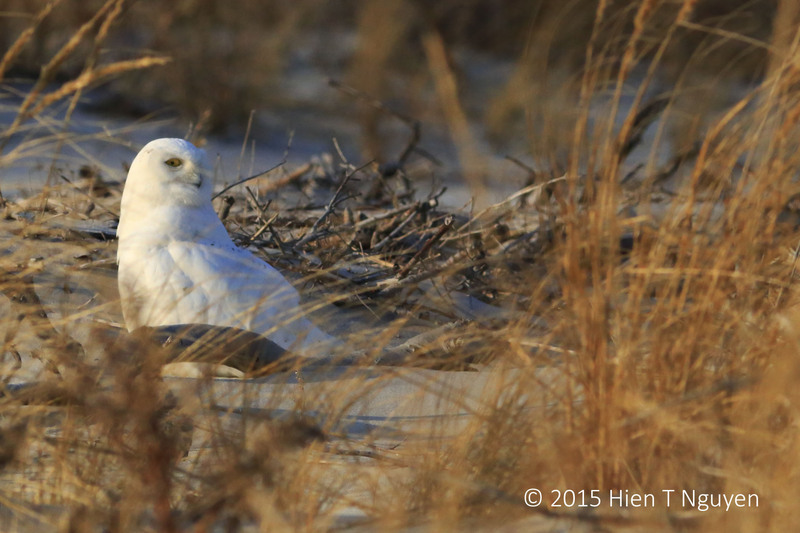 Less than a mile from the entrance, two birders enthusiastically pointed out a male snowy owl lying on the sand. Finally it decided that I was close enough, stood up and prepared to fly away. It was truly most majestic in flight, but I could not react fast enough to take any picture. 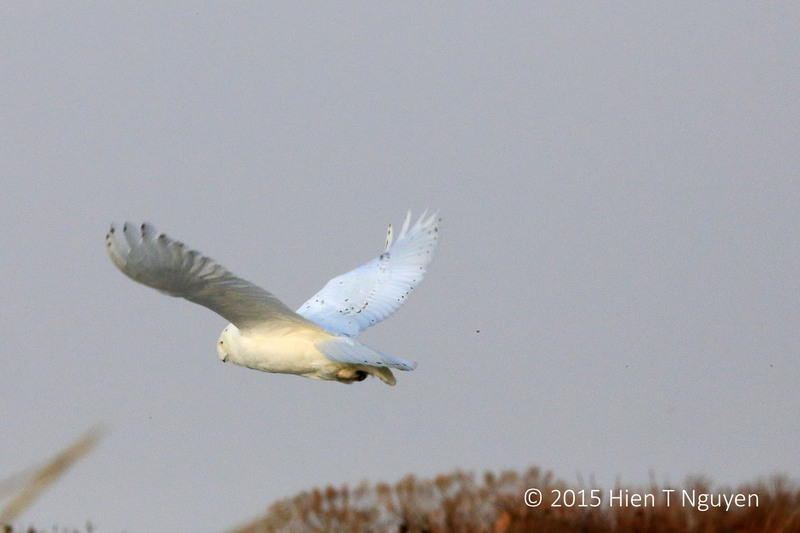 Last year, I did manage to take two shots of a snowy owl, also a female, in flight. Click here to view them. 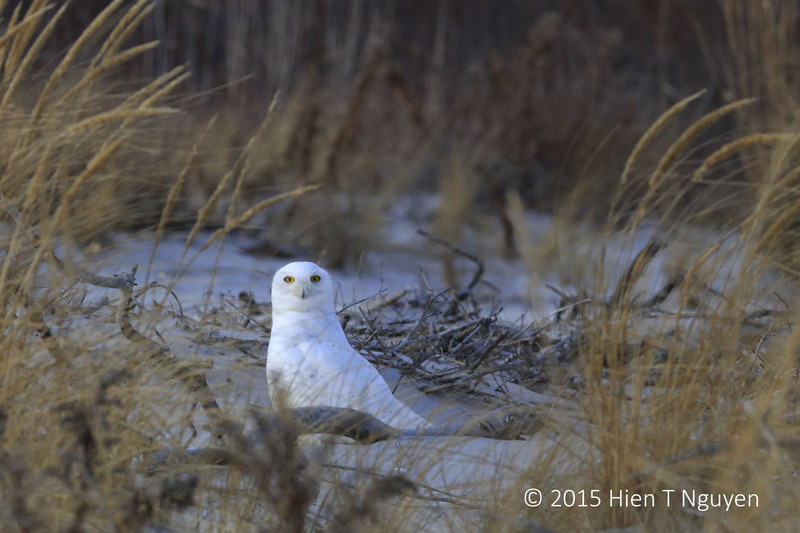 A fellow photographer told me there was a third one, a juvenile snowy owl, but I did not see it. 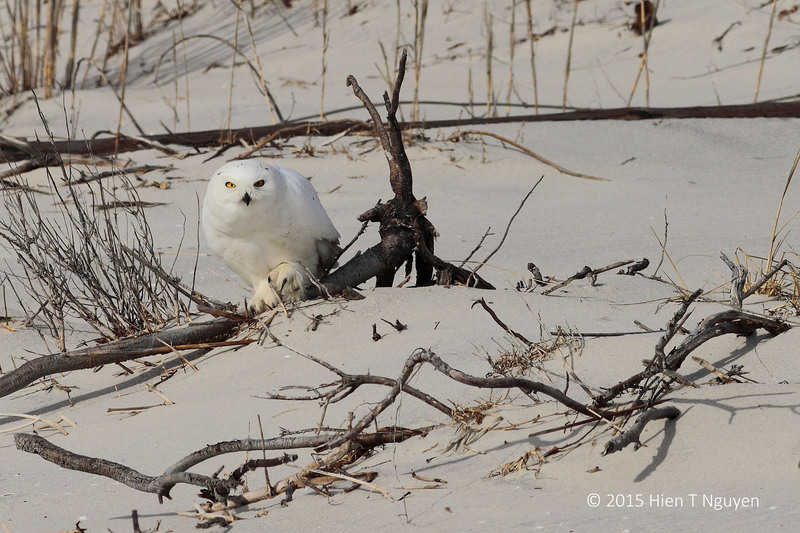 Juveniles are not as white as adult owls, so they can be well camouflaged amid the dunes and vegetation.